Manage parts and pricing for each project with customized proposals, documents and a parts takeoff list, each generated automatically from your original HVAC designs. Right-Proposal® gives you the ability to save time by helping you manage and generate proposals as well as take advantage of custom libraries. Keep track of pricing, margins, and discounts with the custom proposal libraries. View overview video. Generate accurate parts takeoff lists from your designs. Right-Proposal® will pull information from your libraries and automatically put together lists based on your design to give the most accurate estimate with only your parts and pricing on the bill of materials. 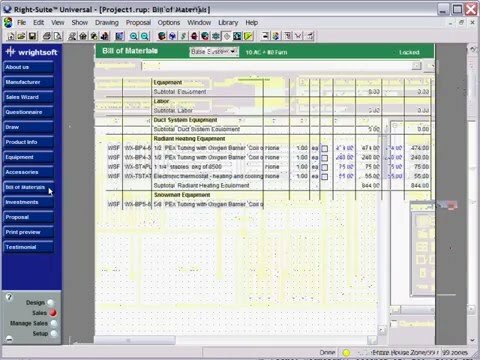 This includes many features including separating into custom categories, adding parts or prebuilt assembly kits, adding “one-off” items, creating a Bill of Materials (for Duct, Radiant and HV), adding items to templates for future quick accessibility, and more. Produce professional customized proposal documents without manually entering any data. Take advantage of the powerful word processor built into Right-Proposal®, preparing your documents with text, images, tables and more. This document is exportable to a PDF or RFT. View and change part numbers directly on the Right-Draw® screen. Create smart objects in the draw catalogue. These smart objects, (thermostats, dampers, condensing pads, line sets, wire, etc.) are each assigned a part number and are included on the Bill of Materials. Save commonly used blocks of text for highly customizable proposals. Build comparison-based option proposals or single system proposals, or use or personalize one of the many included examples. Right-Proposal® saves time by importing data automatically from other parts of the program such as customer information, selected equipment, price, accessories, and more, and gives you the option to print a professional, customized proposal on the spot, for a one-call close. ight-Proposal gives you the ability to manage and generate proposals as well as take advantage of custom libraries. You can store building information, materials constructions, and even your parts and pricing in the libraries to generate accurate parts takeoff lists from your designs. Either Right-J®, Right-F280™, Right-CommLoad™, or Right-N®. We highly suggest Right-Draw® and Right-D®, Right-CommDuct™, and Right-Radiant® as needed.